Chip Kelly will bring his crazy offense to Tampa Bay, where it will promptly fail. The University of Oregon sports teams are trend-setters in terms of their terrible uniforms. Thanks to their status as a Nike testing lab, Oregon gets new uniforms for every reason. Now, they’re going to have to find a new head coach. 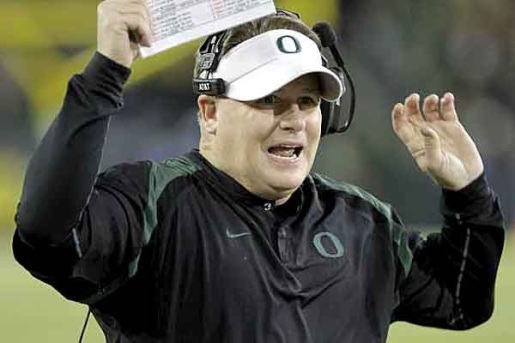 Oregon Ducks head man Chip Kelly is looking to move to the NFL. Kelly is going to be the man in charge of the Tampa Bay Buccaneers (assuming everyone agrees on how much money to overpay him). Kelly has only been the head of Oregon’s program for three years, but those have been very successful years. Kelly’s Ducks have won the Pac-10 or Pac-12 title for three years in a row, and they’ve been to three BCS games as a result of their successes. Given Kelly’s reputation as an offensive guru, perhaps he can add some teeth to the Tampa Bay Bucs terrible offense while retaining their fearsome defensive reputation. And hey, while he’s there, maybe he can change Tampa Bay’s uniforms back to those awesomely lame creamsicle orange unis!